If you have need of a heavy-duty belt, then look no further than the Doubled Norman Buckle Belt. This durable buckle belt has a double-layered design that gives this belt a rugged and rough look that is perfect for warriors and brigands. 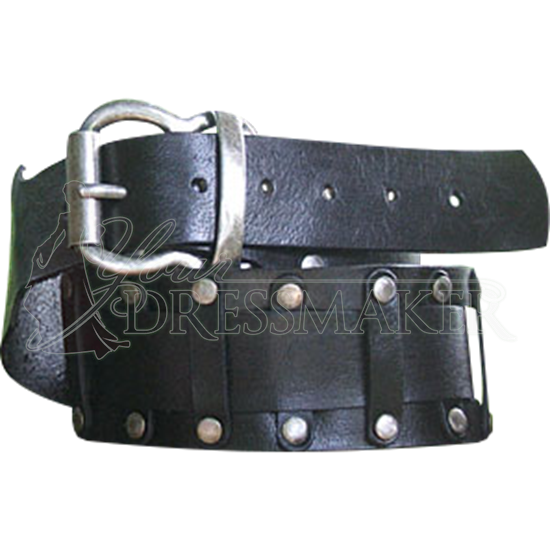 This leather belt is hand-made from 100% leather and features a double-layered design, where-in one band of leather rests atop a wider band of leather. In this belts case, the original band splits into a wide and a narrow band, with the narrow band being woven over and under leather straps that decorate the wider band. Eventually, the two bands rejoin and then sharply taper into a strap that is fed through the buckle and used to secure the belt around the waist. 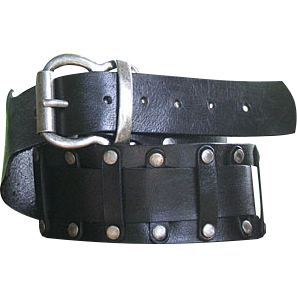 The Doubled Norman Buckle Belt is available only in the color black with silver-colored hardware, but comes in four different sizes. Make sure you order according to your waist size, so that the belt fits properly. The Doubled Norman Buckle Belt is best used by rough, tough individuals that are going to use the belt to keep their sword frogs and tankard straps up, although really, anyone can use this belt for any number of purposes, as the belt will perform just like a belt should.